Ask any retailer why the holidays are the "most wonderful time of the year" and you'll hear about customer traffic, sales conversions, and volume. Despite the increase in showrooming and online shopping, every year, millions of people literally line up to shop at brick-and-mortar stores during the holiday season. Increased inventory and sales volume mean that seasonal marketing can become a deciding factor in increasing revenue. In addition to regular items, many retail and commercial establishments (and restaurants, and service businesses, and and and…) add specialty seasonal items that they know will sell in quantity. Effective seasonal retail merchandising needs to be high impact and high visibility in order to attract customers. We've made a list — and checked it twice — of our recommended holiday marketing display fixtures and accessories, along with product merchandising tips designed to create attention-grabbing features in stores or at promotional events! There is something naturally warm and inviting about the look and feel of real wood. Rustic merchandising displays take advantage of this by bringing an element of warmth into any environment. Seasonal and holiday store decor frequently uses branches, trees, and snow to evoke the spirit of the season in shoppers and visitors. Unfinished wood fixtures, like the stacking crates shown here, are a perfect way to incorporate the a natural feature element into even the most modern product displays. Stacking crates wrapped in festive paper as open-front "presents"
Gift cards have long been the salvation of last-minute shoppers! However, today's increasingly global shopping environment means that in addition to branded in-store cards, it's now easy for retailers in every market to carry, and sell, gift cards for a wide variety of apps, games, and online outlets. Providing a high visibility gift card selection can turn a customer who is ready to move on to the next store into one who's happily handled all their festive purchasing in one place! Holiday retailing comes down to just one thing: increased sales traffic. For many businesses, up to 80&percnt; of their annual income can come during the period between Thanksgiving and New Years. Inventory moves faster during the holidays as shelves are filled and refilled to meet customer demands. Sturdy cardboard stands and shelving units are made to withstand heavy use over a shopping season, without breaking the bank. Having dedicated specialty sections and displays that help help customers narrow down their choices or fit into themes can make shoppers feel like your store understands their needs. Label freestanding corrugated floor bins full of stocking stuffers as "Santa's Favorites"
Bottled wines or liquors are time-tested, popular choices for holiday celebrations, entertainment and gifting. Festive merchandising for alcohol and specialty drink products needs to offer high visibility, easy accessibility, as well as safety and security. 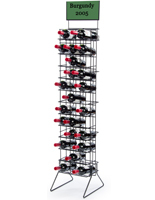 Wine merchandising floor racks also need to allow shoppers to easily move around the sales floor. Staggered height nested display tables are great for creating concept advertising, whether used together as a feature or separately throughout the store. Larger freestanding fixtures are a logical choice for creating co-branded or paired displays that combine everyday sale products with specialty holiday stock. When used in conjunction with risers, wall signage, and hanging fixtures, nesting tables can easily become a focal point in showroom or gallery-style environments. 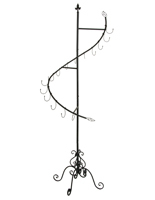 Freestanding clothing racks are particularly effective when used in-department for non-clothing decoration, or out-of-department when loaded with festive holiday attire. 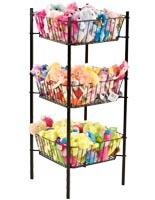 From single-item hooks to multi-level portable clothes display stands with adjustable height arms, these versatile racks easily accommodate a variety of merchandise and decorating materials. Freestanding dump bin fixtures are versatile baskets and displays in a variety of sizes, shapes, and materials to hold almost any products. Simple baskets filled with soft goods, grab-and-go point of sale accessories, toiletries, toys, and mini-gifts are a perfect way for any business to attract customer attention to potential last-minute and impulse buys. Smaller counter bins offer enticing eye-level bulk merchandise displays that are sure to attract attention in any retail or commercial environment. 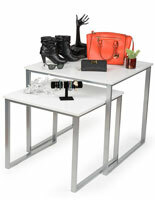 The manageable size makes these stands and countertop racks easy to move even when fully loaded. Have separate bins — or even entire fixtures — separated by different shopping options: women's, men's, children, ages 5-9, pre-teen, girls, boys, students.... the options are endless and can be easily tailored to any product base or preferred demographic. 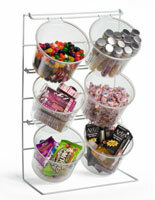 Bulk food display bins are a big part of what makes a kid in a candy store feel like a kid in a candy store! Impulse buys as as much a part of the holiday shopping experience as detailed lists. Making small, inexpensive items easily accessible to shoppers serves multiple purposes. Bulk bins encourage browsing, which increase time spent engaged on the sales floor. Last but not least, arranging brightly colored products inside clear bulk bins can help create festive decor. Is your business, store, or department ready for the upcoming rush? Consumers —customers— begin to think about, plan, and/or actually start their holiday shopping much, much earlier in the year than the actual "Holiday Shopping Season". Industry sources such as the National Retail Federation state around 40% of the annual store revenue, however, occurs during the holiday season. Finding the balance between being ready for the increased traffic in advance and over-saturating customers with festive cheer can be difficult. When preparing any business for the holdiay season increase in consumer traffic, things to think about include floor plan revisions to accommodate more traffic, adding extra fixtures to display larger quantities of merchandise or specialty items added only for the season, and ensuring that everyday and promotional advertising is easily visibility via poster hangers, floor stands, and special storefront window displays. What are some of the most effective seasonal merchandising fixtures? Specialty Merchandising fixtures such as gift card holders, hat racks, or CD/DVD displays, are meant for a particular product line or merchandise format. 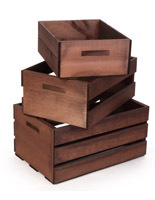 In addition, some fixtures, like wooden bulk bins and woven wicker baskets, are made of special materials or designed to bring a particular look or feel into display decor. Floor Display Racks are available in a wide variety of materials, finishes, and sizes, allowing commercial businesses and retail stores to showcase any merchandise or advertise any service as needed. 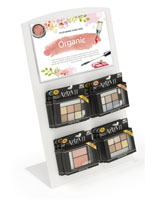 The portable nature of many of floor display racks is ideal for holiday merchandising, as they can be moved as needed to accommodate customer traffic in stores as well as easily transported for use at off-site promotional events and trade shows. Bulk Merchandising Displays are an ideal solution for managing increased inventory levels without sacrificing visibility, accessibility, or store organization. Freestanding dump bins are easily moved to follow customer traffic paths, or placed in entrances and exits to quickly engage shoppers. 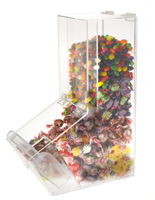 Countertop bulk displays are a perfect way to promote impulse sales at point of purchase, and specialty bins for food, candy, and smalls offer high visibility in even the busiest locations. Surviving the holidays isn't just for customers any more. Each year, commercial and retail businesses are forced to start their specialty festive advertising a little bit earlier, and to purchase more and more inventory to keep up with competition. Showrooms, aisles, trade show booths, and sales floors all need to be quickly updated to accommodate changing inventory without breaking the bank or the budget.